A Samaritan's Purse emergency response team arrives to help out at last year's Fort McMurray fire. Samaritan's Purse Disaster Relief Units are on their way to Okanagan Indian Band to assist with the clean-up of flood-damaged homes on the reserve. Samaritan’s Purse and the Billy Graham Evangelistic Association of Canada are sending crews to help the Okanagan Indian Band clean up after spring flooding damaged hundreds of homes on the reserve. 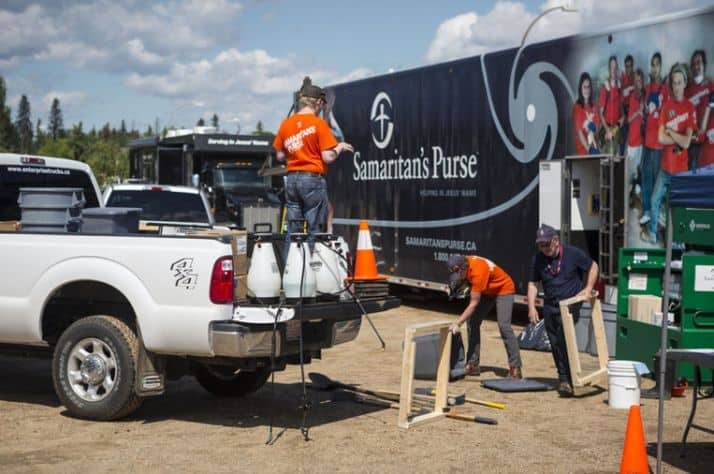 Samaritan’s Purse, a Christian relief and development organization, said in a news release, it is moving its Calgary-based Disaster Relief Unit to Vernon, where staff will meet with local homeowners and recruit and train volunteers. The Disaster Relief Units are tractor trailers outfitted with essential disaster recovery equipment including generators, pumps, hand tools, and safety gear for volunteers. They also serve as volunteer co-ordination centres, and are equipped with a self-contained office, communications system and other supplies. More than 400 homes were damaged during the flooding, 200 badly enough that residents had to leave. Recovery work is just beginning now as the lake water recedes. While Samaritan’s Purse helps with the physical needs, the Billy Graham group is offering spiritual help by sending Rapid Respond Team chaplains to the Okanagan.